Knomee is a self-tracking app, like the mood trackers that you may already have on your smartphone, or like the tracking app that comes with most connected wearables. Knomee belongs to a new generation of mobile applications that brings the power of data science to your smartphone with the absolute respect of your privacy. Knomee helps you - through your quests - to improve your life through behavior change. A Quest is a question that you are asking to yourself and investigating through self-tracking. A quest is about living a better life and selecting something that you want to improve (sleep, well-being, mindfulness, fitness, performance in a given sport, etc.). 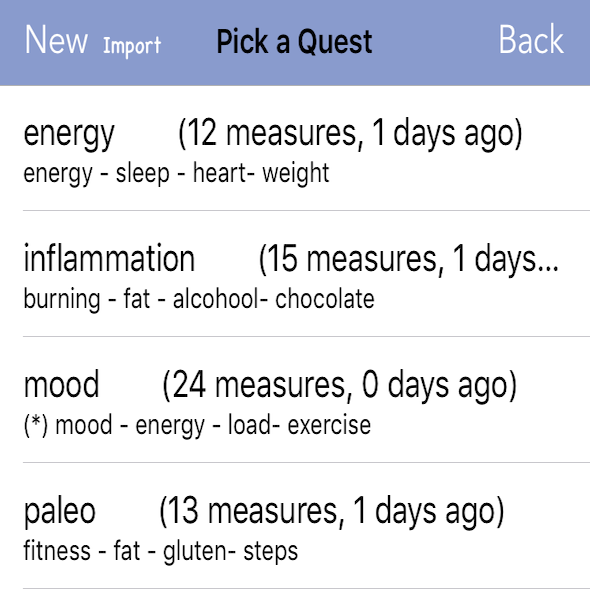 A quest is a collection of new trackers. To create your own new quest, you click on the left upper button whose name is the current quest (default). The quest screen is used to select the quest that you want to use, but you may also use it to create a new quest by touching the button New. Knomee will ask you to create the target tracker, as well as one to three additional trackers. Knomee let you manage multiple quests, that you will keep for a long or a short time as you wish. Think of a quest as a "Knomee-supported adventure" to find out if your hypothesis works or not. Not all quests are useful, sometimes you behavior change is not worth the effort. You can create new quests or modify existing ones. You may change the names, the labels and the target values of any tracker. However, the true value of Knomee is to help you define your own quests ! Knomee was designed because self-tracking is unique to each of us: what we collect, why, the kinds of correlations and the insights that we may draw. Self-tracking starts with trackers : Knomee is designed to make recording as fast, effortless and fun as possible. You use your thumb to move the sliders on the right side - you can add a new self-tracking with four tracker values in less than 10 seconds. 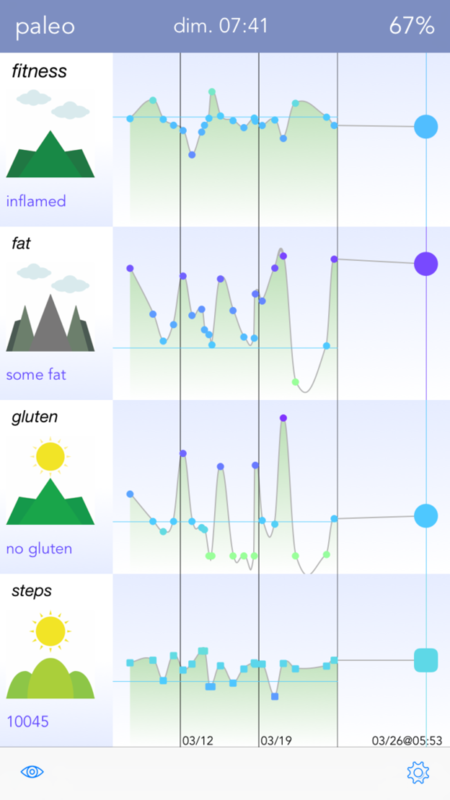 Each slider represents a tracker, which is one the things you want to track. The center of the screen shows you the recent history. The right part gives you both the label attached to the slider's value and a mountain icon that tell you how you are doing relatively to the target that you set. Set some values using the vertical sliders and store this measure using the bottom center button. Once a measure is set, the "+" center button becomes "edit", so that you can modify the most recent measure the same way. The essence of Knomee is to create new quests that are uniquely suited to you. This is done by create a set of trackers, from 2 to 4. The first tracker is your goal, the dimension that you want to improve. The other trackers are called "factors", because you believe that they may play a role with your goal. 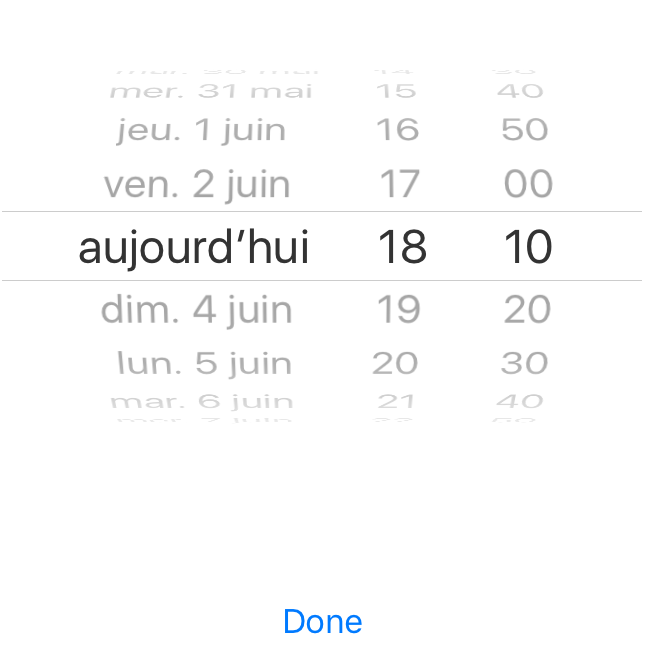 Imported means that the values are read automatically from your smartphone, using Apple Health Kit protocol. Knomee knows how to import number of steps (dailty), weight, average sleep time (over the last 24 hours) and average heart rate (over 24 hours). This makes Knomee a wonderful companion of connected devices ! There is no value in storing all your tracking data in you smartphone Health application unless some data mining expert, such as Knomee, derives some insights from this data. Knomee helps you to learn about yourself through time. Knomee provides both with fun and deep feedback; both with short-term and long-term insights about your quest. 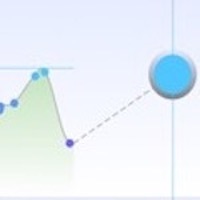 Knomee help you to answer the question "is my behavior change bringing results towards my goal" ? 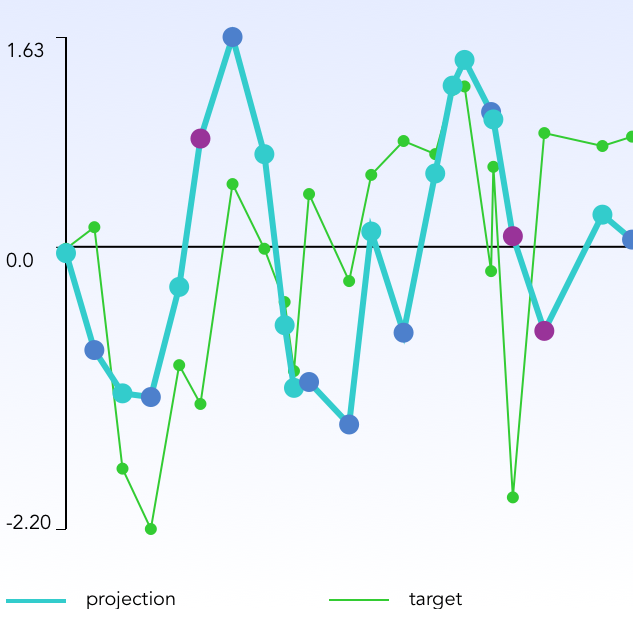 The chart is a graphic representation of how your tracker evolved throughout time. This is the simplest form of feedback : notice that Knomee adds a color. Green means that the factor has a positive role towards your goal. Red, on the other sense, means that the factor has a negative role. 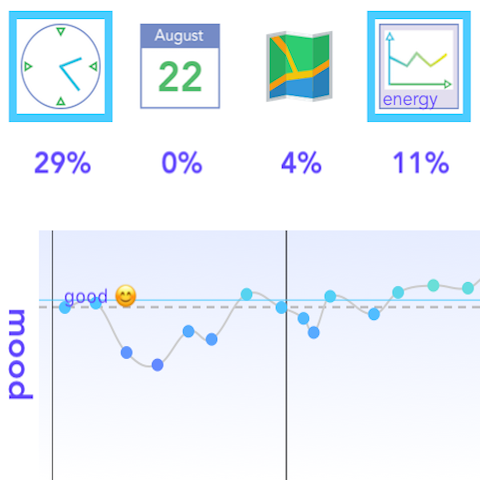 The main screen shows a simplified plot of the latest measures that you recorded with Knomee, but you can access your full history either through the eye right corner button or by swiping up the left part of the main screen». You return to the main screen with the back button or by swiping down. 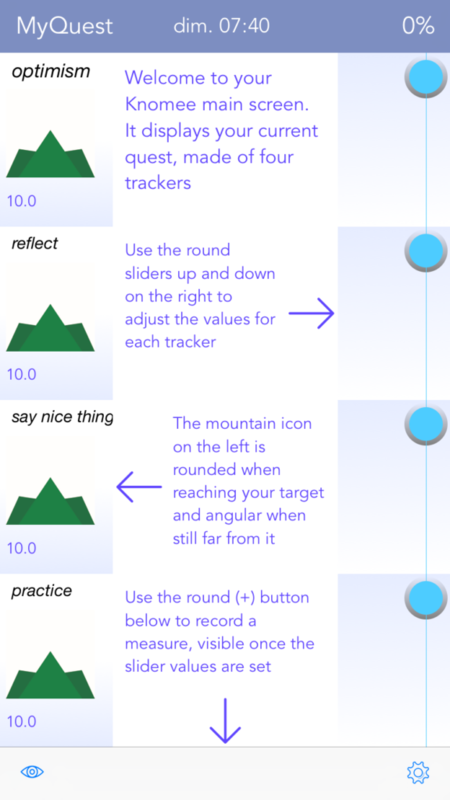 Knomee uses stylized mountains on the home screen to tell you how well you are doing with respect to your target values. 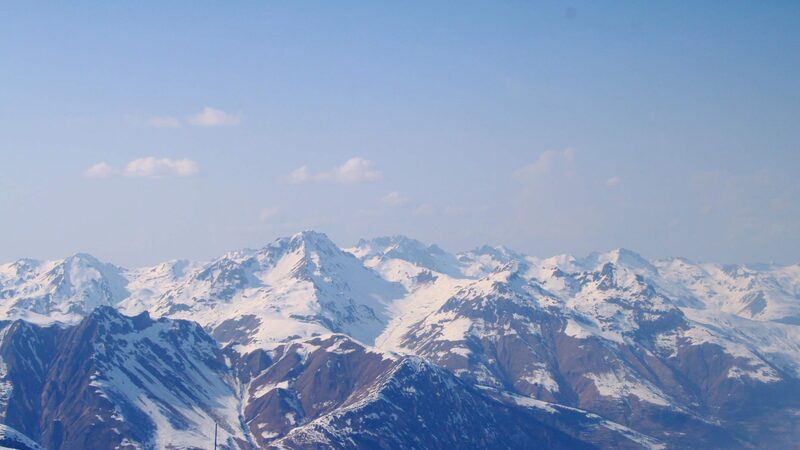 A round mountain is a happy sign, while a rugged mountain tells that you are still far from your target. The weather elements add pieces of information about the trend: rain means that you are doing worse than before, while sun indicates progress. The chart view screen (on the right) shows 6 factors on top that may be clicked for deeper analysis. Each of the square is a button that gives access to a "data vizualization" screen. Run Knomee under the "Geek mode"
Setup up a notification reminder, that Knomee sends either every day (if "time" is selected) or every X hours (if "cycle" is selected). The time dial is there to say when you want to receive the notification (time), or to set up how many hours should the cycle last. Send us feedback using the quick "three sliders" poll. Knomee was built to custom-design your unique quest, which captures your desire to improve. You have read that a quest is a belief that you may improve something in your life through behavior change, and that this behavior may be tracked. Knomee will help you to find out if your hypothesis is true : self-improvement is tricky and not all behavior changes are worth the effort. But if your belief is grounded, Knomee will help you get better rewards from your effort through self-tracking insights. When you open Knomee, it comes with a few pre-defined quests, but this is only the begining ! You will use Knomee to craft your very own quests, that are unique to you and your aspirations. 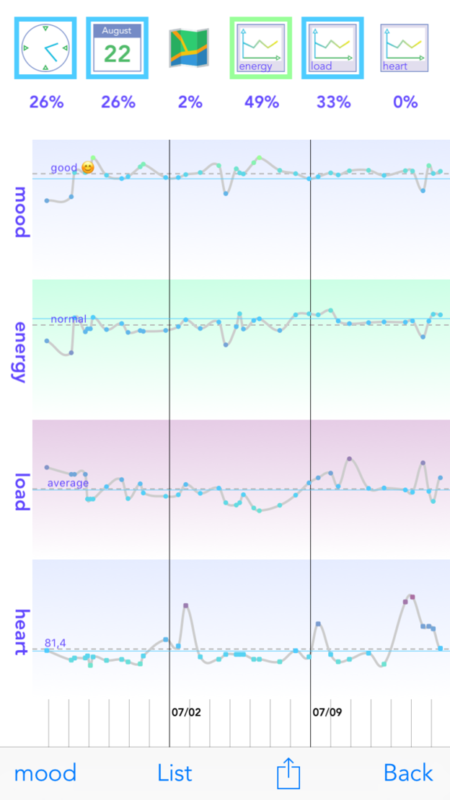 You can now see that Knomee is much, much more than the mood tracking - or other self-tracking - applications that you may find on the store. Here is a lexicon of the key features that you will learn to use. As with all good things, learning takes time. using the left bottom button or by swiping up on the left part of the screen, you can see your tracking history. You return to the main screen with the back button or by swiping down. Whenever you have not used Knomee for more than four hours, the main screen displays a forecast : each value for each tracker is guessed based on past value, and a “weather forecast” icon is shown to illustrate the trend. Sunny means that the value is close to the target value that you have defined, rain means that you are far from the target. The nuance in the weather also tells you if things are improving or not. If you swipe up - or if you click on the eye icon on the bottom left - you access the data screen with detailed display of the tracker curves. On the top of the data screen, you see five symbols. They represent the possible factors that may influence your target tracker: hour of the day, day of the week and each of your secondary trackers. Under each symbol is a percentage which we call the causality contribution insight. The higher and the closer to 100%, the more likely is that this factor plays an important role in your quest. The top right value on the main screen is the ken score, which tells how much knowledge you have captured so far with your quest. If you click on the percentage, you get the KenScore page, including this explanation page. 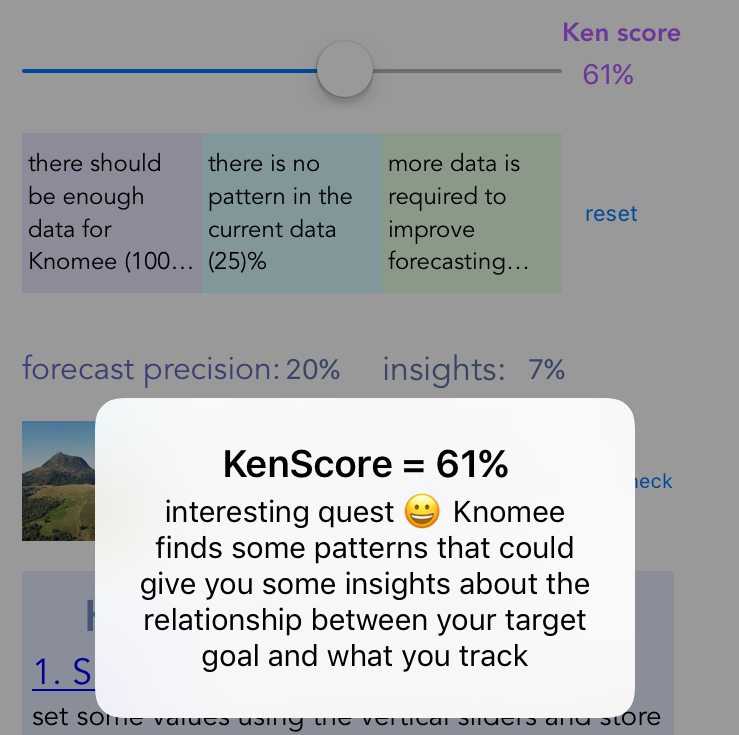 The ken score gets higher when you have accumulated enough data, when the data is regular enough, and when the model extracted by Knomee seems a good enough fit (that is, the forecast is not so different from the values that you have entered). Qualitative tracking is the most powerful because it is the most personal. 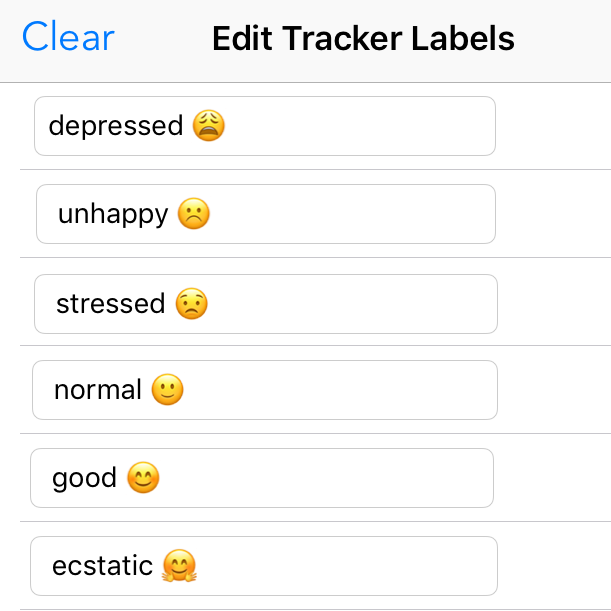 Knomee supports full customization of qualitative trackers by associating a label to each level (from 1 to the maximum level). You define your own labels by clicking on the label button on the setup page. Don’t forget to use emojis to enrich your labels ! Sometimes you get it wrong, you can edit your table of measures by going to the data screen (bottom left button or swipe) and then selecting the list button. 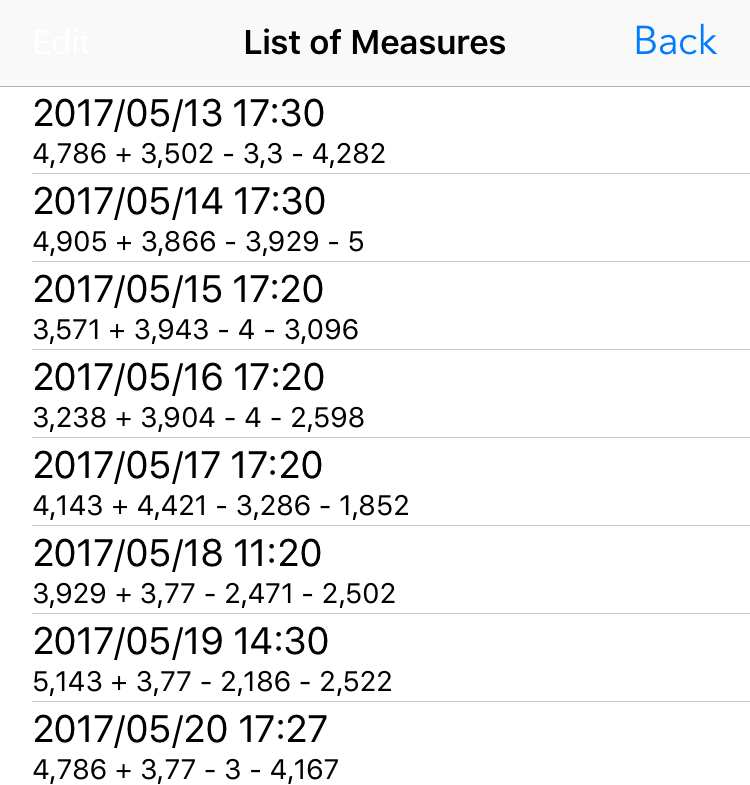 This list of all measures associated with a quest can be edited : you remove the measure that you do not want by swiping left, as usual on the iPhone. 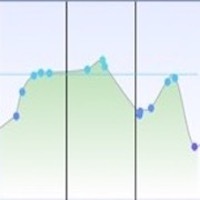 The mountain icon tells for each tracker how well your are doing with respect to the target values that you have defined. 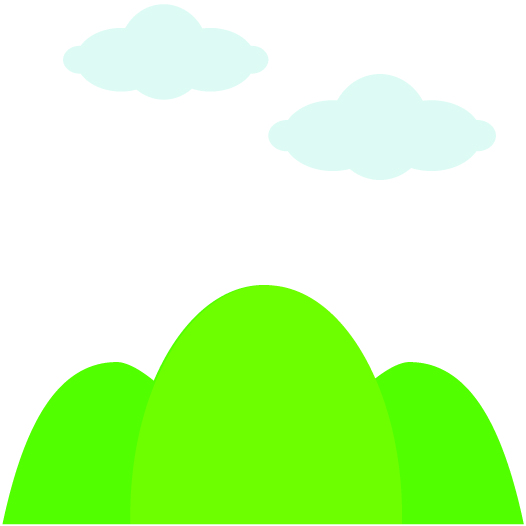 After a few measures, when there is enough history, Knomee adds weather to the mountains. A sun indicates that you are making progress towards your goal, clouds mean that you are more or less stable while rains means that you are moving away from the target zone. 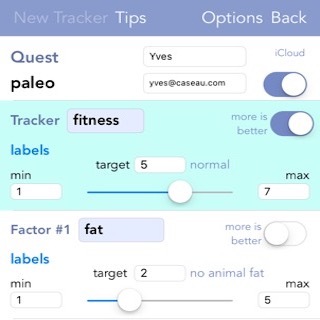 A quest is a collection of new trackers. To create your own new quest, you click on the left upper button whose name is the current quest (default). The quest screen is used to select the quest that you want to use, but you may also use it to create a new quest by touching the button New. 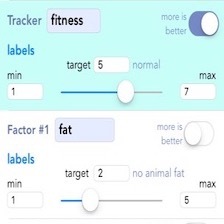 Knomee will ask you to create the target tracker, as well as one to three additional trackers. Trackers may be of three kinds: quantitative, qualitative and automatic. You may switch from one quest to the other by selecting the quest menu through clicking on the quest name (left upper corner of the main screen), you may also swipe anywhere on the left haft of the screen, right or left, to move from one quest to the other. Knomee uses the strictest privacy-by-design approach, so that all the data in the application stays on your iPhone. You can set a number of useful options using the option menu in the setup view (on the top, on the right). 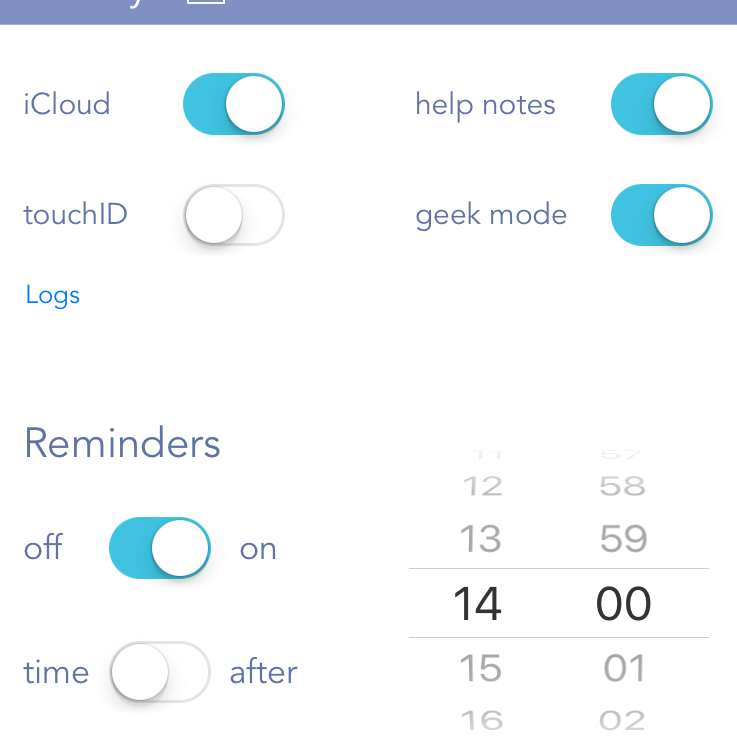 Knomee let you set up reminders to improve the quality of your tracking. You can ask Knomee to send you a reminder every day at a give hour, or to send you a reminder after a number of hours has elapsed. set some values using the vertical sliders and store this measure using the bottom center button. 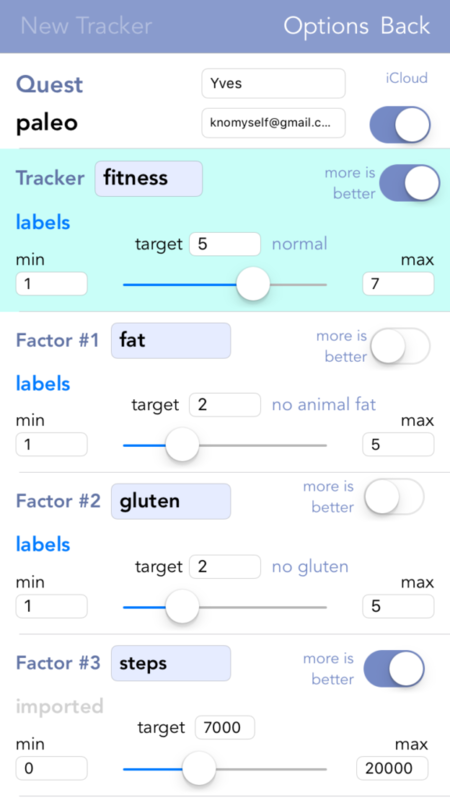 Each slider represents a tracker, which is one the things you want to track. The main screen shows you the recent history. You can get back in time up to 24 hours simply by sliding the slider button to the left. You will see that all slider buttons move at the same time. This is useful when you record your data with a few hours of delay. If you want to add a tracking measure at a specific date, click on the top center button that displays the current tracking time and you will be allowed to set this tracking time to any specific date, hour, minutes. 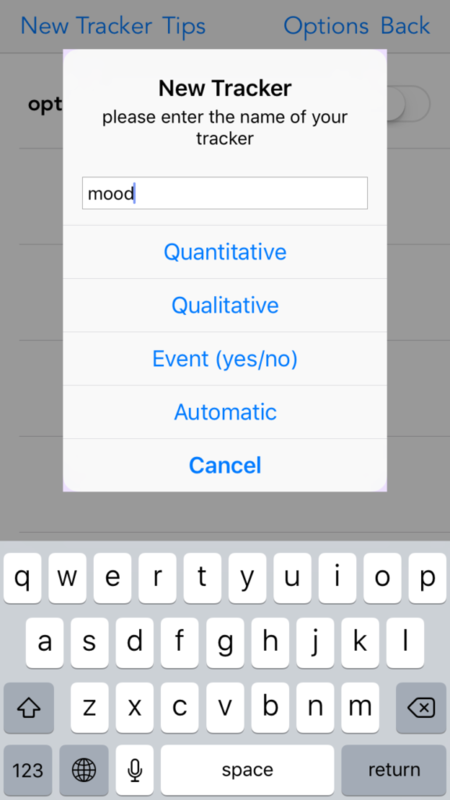 Each qualitative tracker may be personalized using labels that are associated to each qualitative level (1 to n). This way, each level is represented by a word or a group of words that make sense to you. On the setup screen, there is a blue label button for each qualitative tracker.